Real estate developer Crescent Communities in Charlotte, North Carolina, expects to sell 1,000 new homes this year across the Southeast U.S. and Texas, double the number of two years ago. 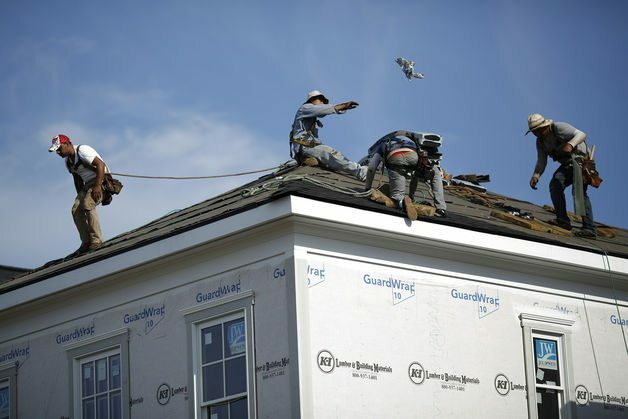 Mortgage rates near record lows, an improving job market and gradually easing credit standards will converge to make it the best year for home construction since 2007, say economists including Mark Zandi, who has testified to Congress on the topic. That will help the economy weather slowing global demand for U.S. exports and a drop in energy prices that is curbing purchases of oilfield equipment, he said. For 2015, the industry may add 1 percentage point to economic growth, which could boost the pace of expansion above the Federal Reserve’s forecast of 2.6 percent to 3 percent, according to Joseph LaVorgna, chief U.S. economist at Deutsche Bank Securities Inc. in New York. His estimate includes construction as well as related services, such as insurance, and goods like appliances and furniture. Last year, housing added 0.3 percentage point to growth, he estimates. Stronger housing could also bolster the Fed’s faith in the economic outlook, said LaVorgna. Policy makers, who meet Jan. 27-28, have forecast they will raise interest rates this year for the first time since 2006 as unemployment declines. “Housing will give the Fed more confidence” in the success of its efforts to stimulate interest-rate sensitive parts of the economy, he said. When the central bank eventually decides to lift rates, it will do so gradually to ensure it doesn’t derail the recovery, LaVorgna added. Fed Chair Janet Yellen in December indicated rates are unlikely to be raised “for at least the next couple of meetings,” or not before late April. Housing starts are likely to rise 15 percent to 1.15 million this year with the pace accelerating in coming quarters, according to the median forecast of 45 economists surveyed by Bloomberg News from Jan. 9 to Jan. 14. Residential construction rose more than forecast in December, capping the best year since 2007, figures from the Commerce Department showed Wednesday in Washington. Home prices increased more than economists estimated in November, according to data Thursday from the Federal Housing Finance Agency. Prices climbed 0.8 percent from October, compared with a 0.3 percent increase forecast by economists in a Bloomberg survey. Not that the picture is entirely bright. Combined new and previously-owned home sales remain below their 2013 level, and the Standard and Poor’s Supercomposite Homebuilding Index of homebuilder stocks has dropped 8.7 percent since Jan. 12 on concern increased incentives to lure buyers are squeezing profits. Housing has been a focus for Fed policy makers battling to restore the economy to health after the 2008 financial crisis, which was sparked by reckless bets on the industry. The Fed bought mortgage-backed securities as well as U.S. government bonds, in a massive asset-purchase campaign aimed at lowering the cost of borrowing that more than quadrupled its balance sheet to around $4.5 trillion. Still, Yellen last May said residential activity “remained disappointing,” and she echoed that sentiment in her press conference after the Dec. 16-17 meeting of the Federal Open Market Committee. “Continuing tight credit conditions for any borrower that doesn’t have really pristine credit” and “depressed” household formation are to blame, she said. There are signs credit is easing. The proportion of banks reporting loosening standards for prime mortgages in the past two quarters was the highest since the Fed started recording the data in 2007, according to the Fed’s October survey of senior loan officers. The average 30-year, fixed-rate mortgage was 3.66 percent in the week ended Jan. 15, the lowest since May 2013, according to data from Freddie Mac in McLean, Virginia. Mortgage rates have averaged 6.6 percent since 1990 and reached a low of 3.31 percent in November 2012. “The significant decline in mortgage rates is reducing the cost of borrowing for lower-income and first-time homebuyers,” said Christophe Barraud, economist with Market Securities in Paris who has been the top-rated forecaster of the U.S. economy the past two years, according to data compiled by Bloomberg. The Obama administration’s plan to cut mortgage-insurance premiums charged by the Federal Housing Administration is “an unexpected present from Washington,” he said. Barraud estimates 1.3 million people may form households this year as a stronger labor market and higher wages bring more buyers back into the market. “Ongoing job gains should see more young adults move away from their parents and form their own households, creating demand,” said Avery Shenfeld, chief economist at CIBC World Markets in Toronto. People under 35 are among the most likely first-time homebuyers or renters, he said. Homeownership fell in the third quarter to 64.4 percent, the lowest level since 1995, Census Bureau figures showed in October. The drop, driven by surging unemployment caused by the recession and the tightness of housing credit in the aftermath, has been particularly steep among those under 35, with just 36 percent of that group owning a home. Stringent mortgage standards have been a particular challenge for entry-level buyers. Kyle Stapleton, 28 who works for a marketing agency, and his wife Caralee, an art consultant, are scheduled to close on a $250,000 purchase of their first home in Atlanta this month. They are planning to buy a new mattress, a couch and new appliances for the five-bedroom home, he said. They got a mortgage with an interest rate of less than 4 percent and were able to afford a larger house than they expected, he said. “We were fortunate to have family help with the down payment which was the final piece of the puzzle,” he said. Demand from millennials, the 82 million Americans born between 1981 and about 2000, is likely to shift over time to more purchases and fewer rentals, said Mansfield of home builder Crescent Communities. While most of his development last year was focused on apartment building, revenues this year will be more balanced with an equal contribution from single-family homes, he said.